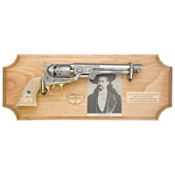 For Western collectors we have Historic Collectible Framed sets of; The western gunfighter, the wild bunch, the gambler, deadwood Historic framed set, deadwood wanted poster, George Custer, buffalo soldier, wild Bill Hickok, Jesse James, Billy the kid, Pat Garrett, Texas rangers, Wyatt Earp, sheriff’s Historic framed set, James brothers, the Alamo and Lewis and Clark Historic framed sets. Gettysburg Historic Frame Set: Pickett's Charge at Gettysburg is shown in this historic frame set featuring a full-size, non-firing replica Griswold and Gunnison Confederate revolver. Pistol mounted with our bullet gun hangers. Frame size: 18" X 7"